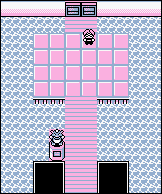 Here at Indigo Plateau, you have one last chance to rest and buy items before battling the Elite Four. You'll fight them one at a time, and you can't leave until you're victorious. This is the moment you've trained for, so good luck! Remember that once you've beaten them, you can come back again and fight any time to amass money and experience. Don't forget to stock up on supplies! 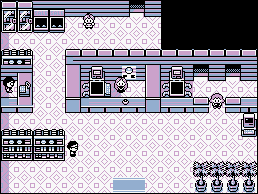 The Mart here sells Full Restores, which fix negative conditions and heal your Pokémon, at a pricey 3,000 each. Also buy Revives, Full Heals, and Max Potions if you can afford them. If not, go back to Celadon City and look for cheaper alternatives, like Lemonade and Paralyz Heals. The Elite Four are just ahead, and the Poké Center at Indigo Plateau is your last chance to buy supplies and prepare your roster. Each of the Elite Four has a bench of five Pokémon, all in the level 50s. Still, you can beat them with Pokémon as low as the high-30s if you plan to exploit their weaknesses. One example dream team (shown below) does this very effectively: Since many have two different types, this team gives you two Electric Pokémon (absolutely crucial for defeating Lorelei's Water Pokémon, and the other trainers' many Flyers), two Water Pokémon (for soaking Bruno's Rock army and putting out some of Gary's Fire), two Flying Pokémon (great against Agatha's Ghosts and Bruno's Fighters), two Ice Pokémon (for Lance's Dragons, Flyers, and Ground Pokémon), and two Psychics to help with the Fighters and Gary's Alakazam. This team is just a suggestion. Good alternatives to these include Blastoise (Water), Charizard (Fire + flying), Gyarados (Water + Flying), Lapras (Water + Ice), Starmie (Water + Psychic), and Raichu (Electric). Useful Pokémon of other types include Parasect (Grass + Bug), Dugtrio (Ground), Dodrio (Normal + Flying), Exeggutor (Grass + Psychic), and Hitmonlee (Fighting). Your first duel is with Lorelei, Mistress of Icy Pokémon. 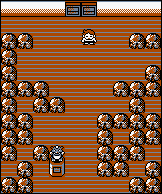 Fire-type, Fighting-type, and Rock-type Pokémon all have a combat advantage against Ice-types. Many of her Pokémon also have Water-type characteristics, so be sure to guard against those powers as well. Zapdos or Jolteon's Thunder attack can easily wipe out any of Lorelei's Pokémon except for Jynx. The first of the four trainers, Lorelei, may well be the toughest… Although if you have strong Electric type attackers, that's not saying much. 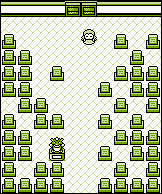 Zapdos learns Thunder at level 51, Jolteon and Electabuzz at level 54, Pikachu at level 43 (R/B; 41 in Y), and Magneton and Electrode can learn it from TM 25… So there's no excuse not to have at least one fighter with this incredible attack that's capable of wiping out four of Lorelei's five attackers with one shot each. The exception is pesky Ice/Psychic hybrid Jynx. Jynx is weak against fire-type attacks, so Charizard, Ninetales, or any Pokémon with Flamethrower or Fire Blast will take her down with ease. Fighting-types also work very well here. Hitmonlee's Jump Kick and Hi Jump Kick, as well as Machamp's Submission are super-effective against her Dewgong, Cloyster, and Lapras. Bruno is the second of the Elite Four trainers. Fighting-type Pokémon are his specialty, but he also has two Onix to round out his squad. If you want to go the distance, remember that Flying-type and Psychic-type Pokémon are more than a match for Fighting-types. Surf (or Fighting skills) rock the Rock-types, and Flying attacks like Drill Peck obliterate Fighting-types. Bruno is the easiest of the four. A Cloyster, Blastoise, or any other Water-type Pokémon can kill his two Onixes in one shot by just using Surf, and his three fighters aren't much tougher. A good Psychic can wipe them out, but you might as well just stick with Zapdos. His Drill Peck shreds Fighters, and he always gets to go first, allowing him to knock them out before they can even attempt to fight back. Zapdos is just such an incredible Pokémon for fighting the Elite Four! If you don't have one already, you must go get one, and if something happens to it in battle, don't be stingy with the Revives. If you don't have Zapdos, any flying-type Pokémon is good, as long as it has a flying-type attack, such as Fly. You may also want to consider a Golduck or a Slowbro. Their mix of water and psychic abilities is perfect for dealing with Bruno's whole team. If it's a challenge you want, then Agatha is ready to deliver. No type of Pokémon has a big advantage in battle over Ghost-types, but Psychic-type attacks expose Gengar and Haunter's Poison-type vulnerability. Ground-type attacks are also very effective, but doesn't work against the flying Golbat. 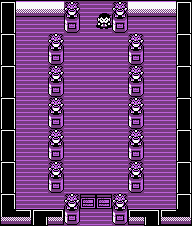 Confuse Ray will get annoying so take the Gengars out quickly with Ground or Psychic skills. Agatha could be one of your tougher opponents if she didn't fight so poorly (despite her claims to the contrary) by wasting turns using Dream Eater against awake opponents and switching her Pokémon basically at random. All of her Pokémon can easily be taken out by psychic and ground-type attacks, so an Alakazam or a Dugtrio would be powerful against Agatha's team. The flying-type Golbat, however, is immune to ground-type attacks, but is weak to electric and ice-type attacks. But if you're missing out on either of those, any strong fighters will do. Lance is the leader of the Elite Four and the most powerful trainer in the Pokémon League. His Dragon-type Pokémon are vulnerable to Ice-type attacks. On the other hand, no Pokémon can defend well against Dragon-type attacks, so keep lots of Potions ready! Ice for the Dragons, Surf for the Aerodactyl, and Thunder for Gyarados. It's just that simple. Lance Dragonairs and Dragonite may be your first experience with Dragon-types, so here's all you need to know: Dragons, including the part flying-type Aerodactyl, can't stand ice. Blizzard may even be overkill since Ice Beam usually means defeat in a single turn. That's why it is best to pack an Articuno. If you don't have Articuno, any Pokémon with ice-type moves will do. Dewgong, Lapras, or other water-types with ice-type abilities are very good choices, as well as other water-types with an ice-type move. TM13 and TM14 contain Ice Beam and Blizzard, respectively, and all water-types in the game can be taught either of these moves. As for Gyarados, let's see… Flying and Water types? That means quadruple damage from Electric attacks, so bring Zapdos or any Pokémon with electric attacks. Your rival defeated the Elite Four before you even set foot on Victory Road, and now you must beat him if you want to claim the title of Kanto Pokémon League Champion. The first half of his team will always be Pidgeot, Alakazam, and Rhydon in Red/Blue, and Sandslash, Alakazam, and Exeggutor in the Yellow version. The final three slots of Blue's bench vary depending on which Pokémon (or Eevee form) he chose earlier. So if you remember which Pokémon he's used in the past, you can find his roster here on this chart and prepare a bench to beat it. But in case you forgot, just remember the element of his Starter currently, and remember what elements it could be. The other two fill in the holes. In Red and Blue, it will be one Grass, one Fire, and one Water. In Yellow, it will be one Electric, one Fire, and one Water. The Zapdos you may already have, or any electric-type Pokémon, especially with Thunder is great against his Pidgeot and Gyarados (or Blastoise) in Blue/Red, as well as the Cloyster or Vaporeon in Yellow. And anything with Surf or Hydro Pump can wipe out the Blue/Red Rhydon or Yellow Sandslash, plus the Fire-type Arcanine, Ninetails, Charizard or Flareon. Ice attacks such as Blizzard beat Venusaur and the terribly weak Exeggutor, not to mention Rhydon and Sandslash if you're pressed for good Water types (which you shouldn't be, but still,) so your only real worries are the Alakazam, and the Electric-types in Yellow (Jolteon is especially nasty). Alakazam is probably the toughest of Blue's Pokémon. If you have Jolteon, Pin Missile is good. Otherwise you'll have to use a Parasect or just throw your strongest attacks at him until he forgets to Recover (Psychics with non-Psychic abilities, like Slowbro and Exeggutor, are also good, as well as other Pokémon with very high physical attack power. However, Alakazam has low defense, so any powerful physical attack can do. If you managed to get a Gyarados or a Dragonite, and it knows Hyper Beam, it can do lots of damage. Also, If you're lucky enough to have a Hypno or Gengar with higher speed than his Alakazam, and it knows the Hypnosis/Dream Eater combo, it might be worth it to give that a shot. Dream Eater can almost dish out enough damage to make up for only dealing half damage to Psychics, but be warned: if your Pokémon isn't fast enough to go first, you could wind up wasting a Dream Eater on a suddenly awake Alakazam, and even worse, he might Recover and waste all your hard work. Jolteon and Magneton are weak against Ground-types, so Dugtrio (or anyone with Dig and/or Earthquake) is good, but your own Jolteon or Zapdos can do well by sticking to their non-Electric attacks. Note: Psychic-type Pokémon deal subpar damage, and have a resistance to other Psychic-type Pokémon. If you have an Alakazam or Kadabra (at least level 50), then you can dispatch another Alakazam with ease. This page was last edited on 8 April 2016, at 17:18. This page has been accessed 645,169 times.